Mermaid Heartbeat is a drop in the ocean of spin. 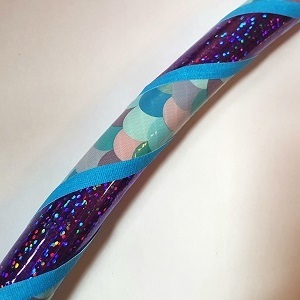 It’s sparkle is second only to actual mermaid scales and it’s all about the dance. 100% Australian made quality, durable, flexible plastic for a longer lasting hoop. Buy your very own hula hoop for fun, fitness and flow! Our dance hoop range is hand crafted in Melbourne for exercise, weight loss and hoop dance. Find the hoop that’s right for you in our range of sparkle and styles. Or, email us to create your own design. Created from quality, 100% Australian made durable, flexible plastic for a longer lasting hoop. Which hula hoop is right for you? This comes down to 2 things: look and size! All hula hoops have grip tape incorporated into their designs which helps keep them up. Once you have selected a hula hoop design that you love, whose spunkiness will inspire you to play, the next step is choosing the right size. Bigger hoops give your body more time to learn, connect and respond, making on-body hooping easier. For beginners, a bigger, heavier hoop is a good place to start. A good size for beginners is the distance from your toes to your belly button. If you are quite tall or have a bigger build, we suggest starting with a 110cm hoop. As you progress and do more off-body tricks, you may want to buy a smaller and/or lighter hoop.